We are passionate about education! 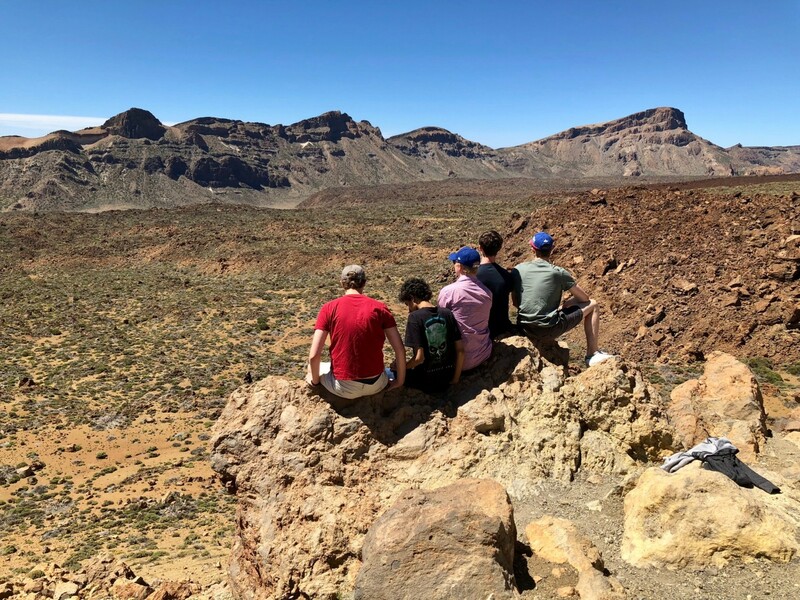 The spectacular volcanic island of Tenerife offers a unique opportunity for school and 6th Form pupils to experience the educational adventure of a lifetime. Our mission is to deliver the best possible experience for them. GeoTenerife is a specialist educational UK tour operator servicing Tenerife with a permanent, dedicated presence on the island. This means we have the best local knowledge, access and networks in Tenerife for educational trips. Our genuine desire to promote the scientific learning potential of the island is backed by twenty years’ experience in the field. We don’t “bolt on” existing tourist trips to our itineraries- we develop our own. Thanks to our long term collaboration agreements with a range of local experts and institutions, we can offer access to a unique learning experience and provide exciting behind-the-scenes visits to installations. No two trips are alike and we work with you to ensure your students get the most out of your time on the island. UK Accreditation: We are a UK company and members of ABTA. We are currently undergoing School Travel Forum certification, and expect to achieve full membership and quality accreditation in 2019.
fully recognised by the local authorities to carry out educational trips and courses on the island. we employ fulltime local, bilingual scientific field trip coordinators in Tenerife to accompany your groups throughout your time on the island and oversee the smooth running of every aspect of your trip. Experts: We are the only UK travel company to have signed collaboration agreements with a range of leading local institutions. This allows us to run internationally-renowned programmes (GeoIntern) and courses (Field School) for university undergraduates. It also means we can supply extraordinary bilingual experts to teach your students during your time in Tenerife. 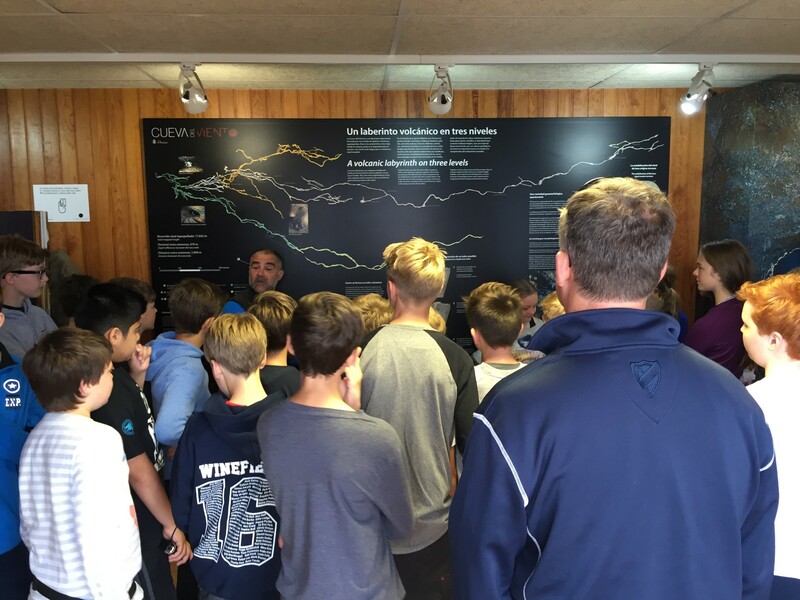 Accommodation: We are also the only UK school trips organiser with our very-own Field Trip Centre on the island. Having worked with hotels for our groups in the past, we came to the conclusion that having our students share their accommodation with other tourists was not acceptable for security but also educational purposes. We wanted to provide an environment for accommodation that was safe, fun and engaging, while also being conducive to learning. In 2018-19 we have undertaken a large capital investment to upgrade our historic HQ to accommodate groups of up to 36 in comfort, with all the parallel facilities and amenities required for groups. Exclusive-use basis for groups of 20+. Focus: We are dedicated to the Canary Islands. We don’t run school trips anywhere else. We like to work in 12-month a year sunshine, with the longest hours of daylight on the planet. It means we get a lot crammed in! We are also passionate about Tenerife as an Island Classroom, and we constantly strive to improve all aspects of your students’ learning experience. The Island of Tenerife juts proudly out of the Atlantic Ocean to the west of Africa and is the largest of the seven Canary Islands. Its stunningly beautiful yet rugged coastline and warm climate are a true paradise for adventurous travellers and its dramatic landscape provides a perfect backdrop to explore new terrains and seek out new thrills. It is the perfect destination for educational school travel trips. For many, the Canary Islands conjure up visions of sun, sea and Sangria. But think again. After 12 million years of volcanic creation, Tenerife isn’t an island to underestimate. Whilst perhaps more commonly thought of as a sun-worshipping destination, it is in fact a biodiversity hot spot with over 300 volcanoes of varying types and sizes. The most prominent, Mount Teide, is in fact the third largest in the world from the sea floor, and the last eruption in its surrounding volcanic complex was in 1909, a mere 110 years ago at Chinyero. And despite its small surface area, Tenerife can claim to have an astonishing wealth of ecological diversity. With a widespread network of microclimates and corresponding habitats, there are hundreds of native flora and fauna species, including unique insects, reptiles, birds and over 100 plant species to be found exclusively on the island. With this in mind, it’s a paradise for aspiring botanists, zoologists, scientists and naturalists to seek out wonders of the natural world. Mount Teide, a World Heritage Site, is Spain’s only dormant volcano and the eruption of its Pico Viejo vent formed the world’s fifth longest lava tube. With lava fields from a range of different types of volcanic eruptions, it’s a little known fact that Tenerife has a greater range of geology on display than Hawaii. Pyroclastic flows generated by ultra-Plinian type eruptions over 12 million years have deposited a large range of ignimbrites of varying geomorphologies associated to explosive volcanism. This makes Tenerife a unique destination for the study of volcanology and geology. 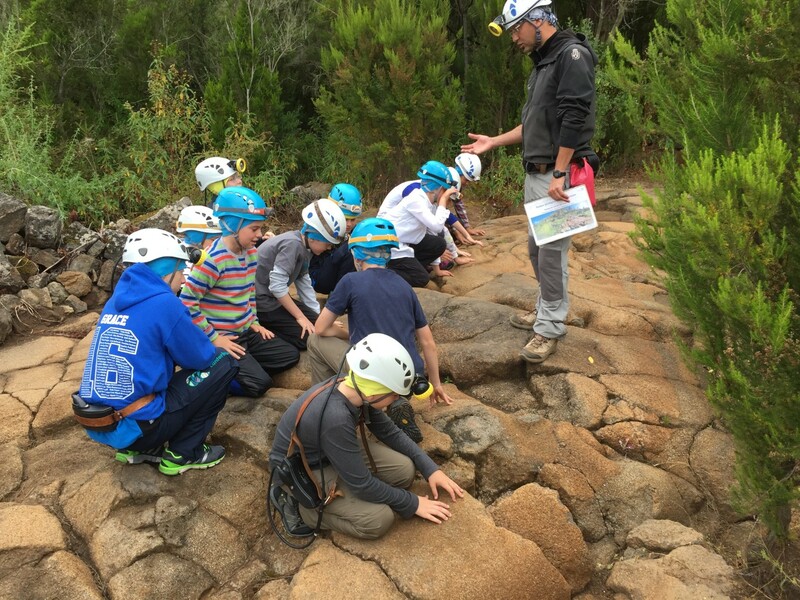 GeoTenerife has in-depth knowledge of hidden gems and remarkable sites for your students to see and study – whether you want to stick to the National Park (but away from the crowds) or venture further afield. You may already associate volcanology, geology and geography to Tenerife, but we cover other incredible subjects here too. As a world-recognised biodiversity hot spot Tenerife has so much more than volcanoes to offer. 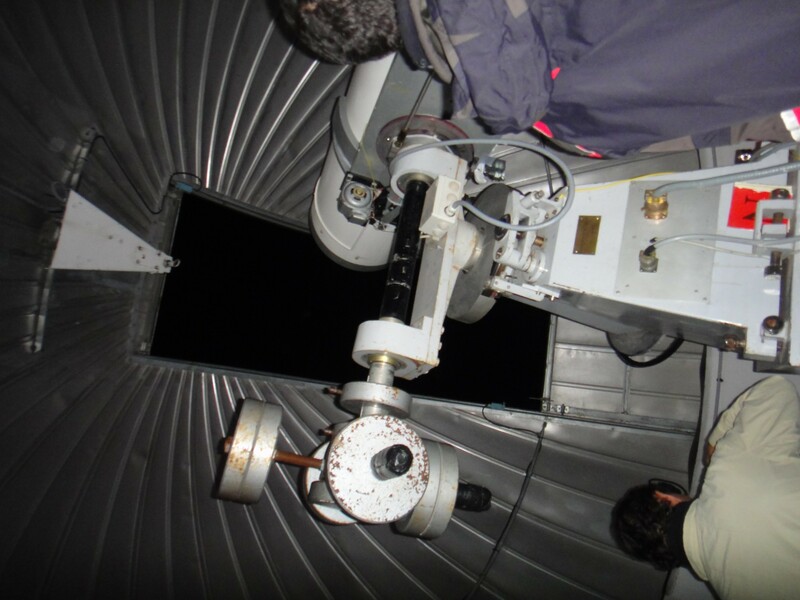 Astronomy: Its clear skies, pure air and strategic geographical location close to the Tropic of Cancer mean that Tenerife is one of the best places in the world for astronomical observation. Tenerife even has a Law on the Protection of the Astronomical Quality of Observatories, also known as “The Canarian Sky Act”, which regulates the level of light, atmospheric and radio-electric pollution, as well as flight paths. There are, of course, several tourist excursions available for stargazing in Tenerife, but GeoTenerife works closely with the nationally-renowned Instituto de Astrofisica de Canarias (IAC) and Teleférico del Teide to offer expert lectures and private trips behind the scenes not available to the average traveller. Botany: Tenerife is the largest and highest of the Canary Islands, which explains why it boasts the greatest biological diversity in the archipelago. There are over 800 species of fauna and flora living here that are unique in the world. With over 1,400 varieties of plant life found on Tenerife, some of which are endemic to specific areas such as the National Park, there’s an abundance of flora to explore and study in detail. Tenerife’s vegetation can be divided into six distinct ecosystems depending on altitude and orientation: coastal spurges and tabaibas; thermophilic forest; prehistoric laurel forest; Macaronesian heath; pine forest and high mountain. GeoTenerife coordinates exclusive tours with experts to these environments so that students can study indigenous species within their natural habitats. Marine Biology: The marine life found in the Canary Islands is interesting as it’s a combination of North Atlantic, Mediterranean and endemic species. Tenerife boasts the greatest variety of whales and dolphins throughout Europe, such as the resident Pilot whale population. GeoTenerife works closely with private companies and public institutions that monitor the heavily populated seas and coasts using a range of associated disciplines including hydrogeography, hydrodynamic modelling and remote sensing which means they have privileged access for undergraduate students wanting to learn from those at work in the field. Want something a little less specific? 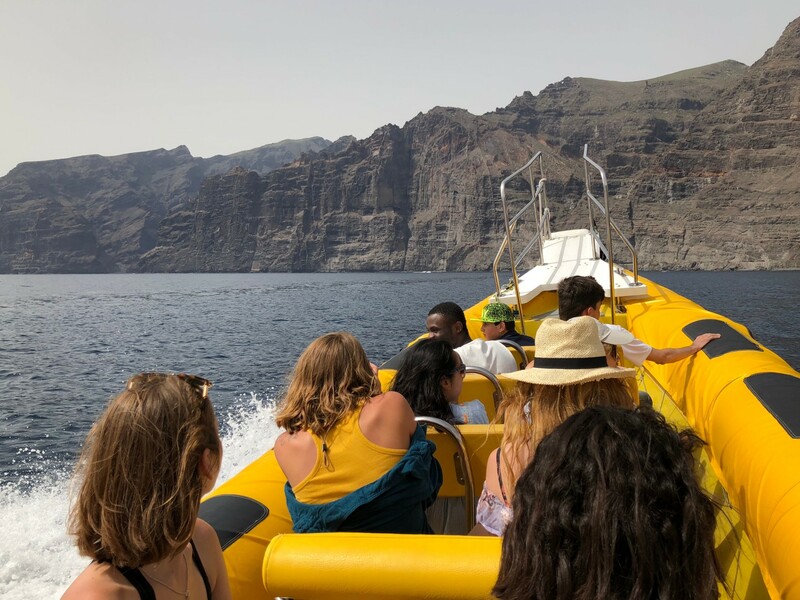 GeoTenerife can add a day to your school trip on the high seas with a marine biologist who can explain the extraordinary variety of life beneath the waves. Renewable Energy: As far as renewable energy goes, Tenerife is setting a precedent and leading by example. Bioclimatic and sustainable housing, windfarms, biodigestors and solar photovoltaic power plants are all present on the island, amongst other industrial installations related to sustainability, such as urban waste treatment plants, desalination facilities, composting and recycling. Those wishing to study such sites need look no further. 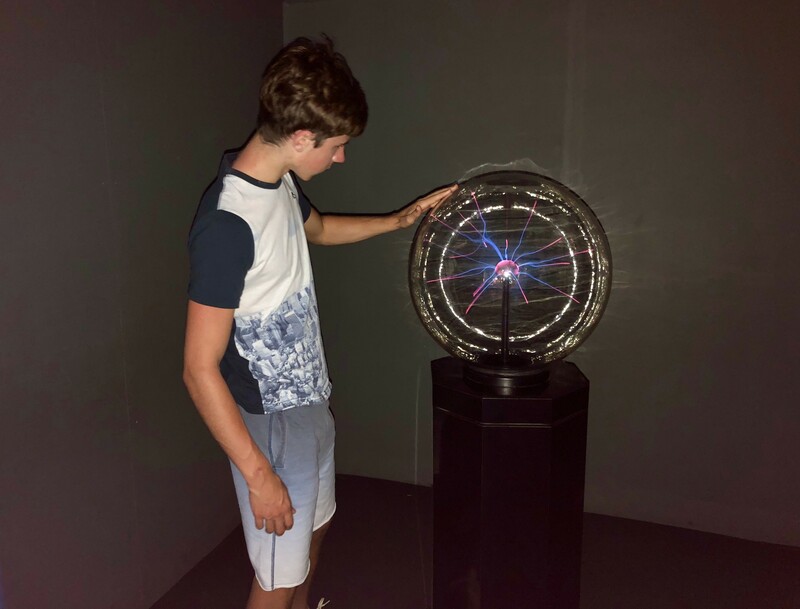 GeoTenerife can facilitate privileged access to these sites and installations to ensure your students can see everything up close and learn as much as possible. Let us surprise and delight you. We pride ourselves on providing unique trips – at a highly competitive price. Let GeoTenerife take the strain! 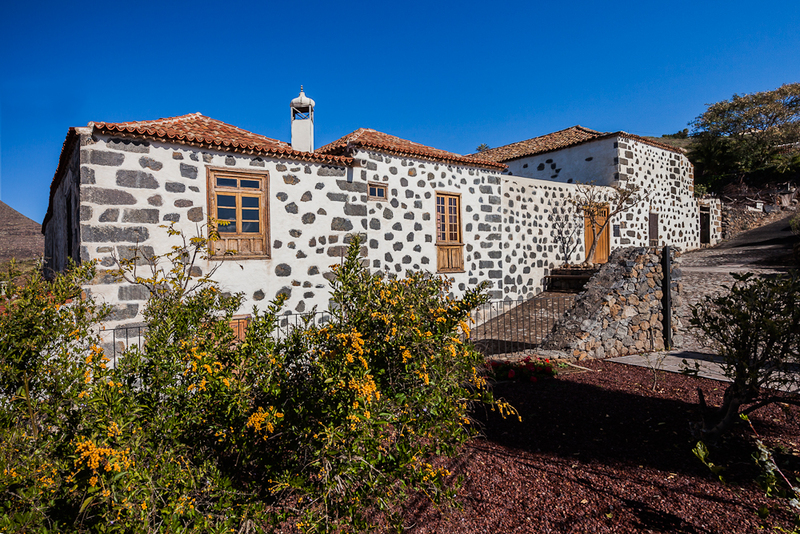 Our centre is close to the pretty town of Vilaflor at the edge of Teide National Park, yet 15 minutes’ drive from the beaches and natural monuments of the south coast. It is the perfect location for an educational trip. We are currently finalising its extensive refurbishment and we will launch for field trips from September 2019. For further information please contact enquiries@geotenerife.com. THREE DAYS OF EXPERTS: local expert to accompany out into the field to exclusive sites and installations for three days, to teach subjects closely associated to your curriculum. 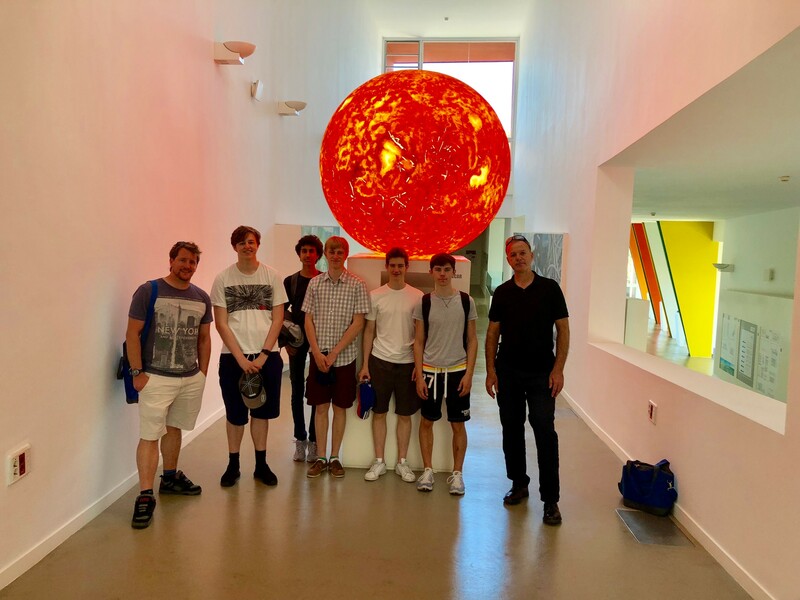 For example, one of our associated experts is a professional volcanologist who can take your students on an intimate behind-the-scenes tour of his work monitoring Teide volcano. We adapt your itinerary to include sites and experts depending on the topics you wish to cover. PLEASE NOTE: If your group intends to carry out any field work whatsoever on the island, you must secure a relevant permit from the local authorities. 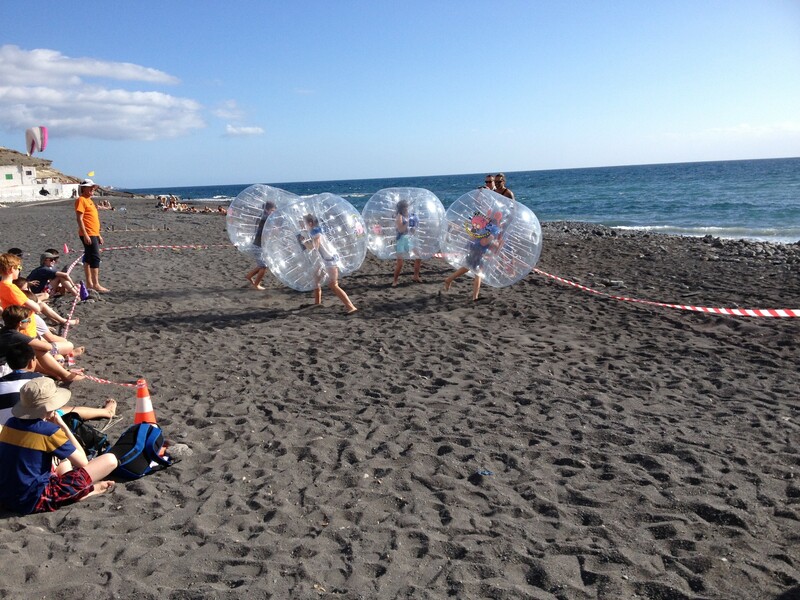 GeoTenerife can organise this for you. Failure to do this can result in heft fines for the group concerned. Astronomy night: an expert and their telescope will come to our Field Centre to deliver a private lecture and learning experience to your students. Water Park or farewell BBQ: School trips need to be fun too! We can round off with an afternoon at the waterpark or a farewell bbq at our iconic Field Trip centre. We offer accommodation, transfers and transport on-island. You let us know the size and age of your group and the number of nights you’d like to come by filling in this form and we will propose an estimate and basic outline for your trip. This is an INTRODUCTORY DISCOUNT OFFER of 20% off our usual price to celebrate the opening of our Fieldtrip Centre in 2019. *For trips booked before the end of July 2019. To book, we require a 10% deposit. Balance due 12 weeks before travel. Usual price: £465 per head for the above. Please note this package does NOT include flights and those are your responsibility to book. We do collaborate with a local partner that can organise your flights for you and we would be happy to put you in touch, or you can use online comparison sites like SkyScanner. There are so many low cost options available to Tenerife, we just concentrate on what we’re good at. Delivering great educational trips in the Canaries! Please note that all our trips are subject to our Fieldtrip Terms and Conditions. We ask you to ensure you read these thoroughly prior to travelling with us. We are a member of ABTA which means you have the benefit of ABTA’s assistance and Code of Conduct. We provide full financial protection for your money.